Owls have long been creatures of myth and legend, and catching a glimpse of one of these elusive birds is always a magical experience. Of the four owl species in Sussex you may already be familiar with the ‘twit-twoo’ of the tawny owl or the ghostly grace of the barn owl, our two best-known and most common species. Our rarest resident is the secretive long-eared owl, whose amber eyes and wise expression could come straight from a fairy tale, and completing the quartet is the diminutive little owl. No bigger than a starling, this species was introduced in the 19th century and is an expert at blending in with the fence posts it often perches on during the day. But at this time of year we have an extra special winter visitor. The short-eared owl migrates here from the snow and ice of Finland, Scandinavia and parts of Russia. Its nomadic nature sets it apart from our resident owls, who don’t wander far, and the ‘shorty’ bucks a few other owl trends too. As you might expect, it is a fearsome nocturnal predator but there is no respite for its small mammal prey as these birds will happily hunt in daylight too, timing their mid-afternoon flights to take advantage of the field vole rush hour. Between meals they will roost on the ground, hidden within a grassy tussock, and come spring when they have made the return journey to their northern breeding territories they will nest on the ground too, only taking to the trees when inconvenienced by heavy snowfall. The ‘ears’ are actually short tufts of feathers that can be raised or lowered depending on the owl’s mood. Since they are often flattened against the bird’s head, disappearing into the dense facial plumage, it’s the eyes that are the most distinctive feature; a piercing yellow gaze accentuated by heavy black makeup that creates a severe and frowning face. 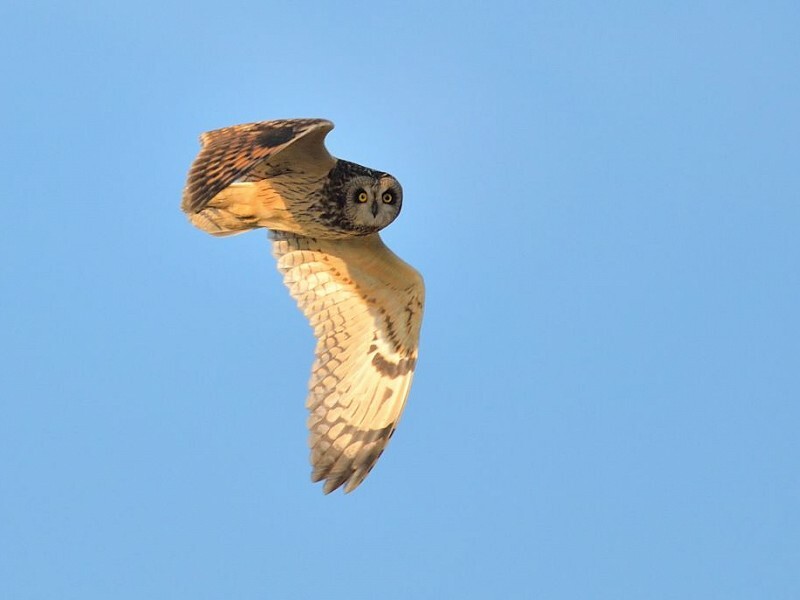 It’s impossible to slip by a short-eared owl unnoticed but they will tolerate a careful observer as long as a respectful distance is maintained. It’s been a good year for ‘shorties’ in Sussex so far this winter, so keep your eyes peeled. My son Andrew and I spent a wonderful 30 minutes or so watching our first sight of a short eared owl hunting at Woods Mill this afternoon (25th January). Food for the soul! A regular sight hunting in the fields beside the Adur. We catch sight of them most late afternoons from about 3pm. I’ve seen this daytime owl twice now down at Bersted Brooks conservation area in Bognor. Incredible. I have also one north of Bramber flying from one side of the River Adur to the other. I and several others on top of a bus saw an owl perched on a TV aerial on the chimney of house in central Ferring about a month ago. I am not sure if it was a short eared owl. A pigeon was perched nearby. I would love to be able to see and photograph these wonderful birds. Any recommendations as to where I could come to reliably see them? I see Upper Beeding is just over an hour for me (from Romsey). Could someone recommend somewhere to park for a walk to see them? Hi Mark. My son and I parked in the car park at Bramber, then walked along the road to the river. Head north along the east bank of the river for 1/2 mile to a mile, there are fields on the right. We saw a short eared owl and a barn owl about 4pm. We met a regular visitor who said he’s seen shorties every time he’s been in the last few weeks. Good luck!